Why Can't America Love a Ukrainian Heavyweight Boxing Champ? American fans' interest in heavyweight boxing may have disappeared along with American boxers' dominance of it—and that's a shame for spectacular talents from other countries. On Saturday, October 5 , Wladimir Klitschko dominated then-unbeaten contender Alexander Povetkin, knocking him down three times and winning a unanimous decision to defend his IBF, WBA, and WBO titles as world heavyweight champion for the 15th time. Promoted by Russian billionaire Andrey Ryabinsky, the bout sold out SC Olimpiyskiy Arena in Moscow, and pay-per-view demand was reportedly high in Europe and parts of Asia. But it scarcely made a blip on the sports scene in the U.S.
Stateside, the fight was broadcast live on HBO at 3:30 p.m. EST with little pre-fight fanfare and practically no postfight coverage at all. There were no video clips or even still photos to accompany the fight recap ESPN aired that night. In fact, Klitschko got more attention in the U.S. news later in the week when his girlfriend, Nashville star Hayden Panettiere, announced their engagement on Live! with Kelly and Michael. Born Vladimir in the Ukraine in 1976, Klitschko took the German spelling of his name when he became a citizen of that country. His stats, though, are reminiscent of some American boxing legends’: His reign of more than seven years as champion is second only to Joe Louis’s 12, and he has accomplished the amazing feat of unifying the heavyweight titles of the WBA, WBO, IBF, and IBO. With 24 title fights, he trails only Louis and Muhammad Ali, who both fought in 27. His career record is 61 wins in 64 fights; 51 of those victories came by knockout. Klitschko is a versatile boxer-puncher; last year, boxing record database BoxRec.com named him one of the three best pound-for-pound fighters active today, after American light-middleweight Floyd Mayweather, Jr. and Mexican welterweight Juan Manuel Marquez. And Klitschko, like many a boxing great before him, has heaps of celebrity appeal. He’s articulate (in Ukrainian, Russian, German, and English) and smart—he holds a Ph.D. in sports science from Kiev State University. Klitschko and his older brother, Vitali, also an accomplished boxer, do charity work for UNESCO. He’s appeared in movies stateside (typecast as a boxer in Ocean's Eleven). So it’s not unreasonable to wonder: Shouldn’t American sports fans be nuts for this guy? 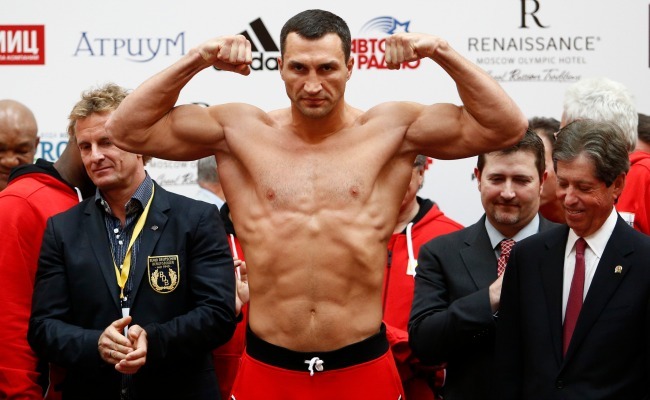 Why have Americans not warmed to Klitschko? As Norman Mailer once put it, the heavyweight champion of the world is either the toughest man on the planet or he isn’t, but there’s a very good chance that he is. So here’s a theory: It may be hard for some American boxing fans to acknowledge that the toughest man on the planet isn’t perennially American anymore (and hasn’t been for some time, as the last time a U.S. man held any part of the heavyweight title was in 2007). For example: When Klitschko emerged as a dominant force in the heavyweight division around 2005, some skeptical American boxing writers—and other boxers—compared him to Dolph Lundgren’s character in Rocky IV: the loutish, steroid-pumped brute Ivan Drago. And all of these fights had at least one thing in common: The champion was American. From John L. Sullivan, who won the bare-knuckles title in 1882, until Muhammad Ali, who retired as champion in 1979, there were 26 American heavyweight champions who won the title either from the previous champ or by winning a tournament. You can count the non-American champs during that time on one hand: “Ruby Bob” Fitzsimmons (who reigned from 1897-1899) was British, Tommy Burns (1906-1908) was Canadian, Max Schmeling (1930-1932) was German, Primo Carnero (1933-1934) was Italian, and Ingemar Johansson (1959-1960) hailed from Sweden. The splintering of the world boxing authority in the 1970s, though, may have been a factor in why the heavyweight title and boxing in general later globalized. Until 1977, the heavyweight champion was undisputedly the man recognized as such by The Ring magazine, once known as “The Bible of Boxing.” But The Ring’s credibility was destroyed by ABC’s “Tournament of Champions” that year: Ring editors were found to have altered the records of several fighters to make them appear worthy contenders. The loss of The Ring as the designated authority on rankings, coupled with occasional title disputes (like when a champion retired, or when Muhammad Ali couldn’t get a license to fight in most states after he refused to be inducted into the U.S. military during the Vietnam War), made way for numerous claimants to the title. It also left rankings completely open to corrupt promoters backed by the dubious self-appointed boxing “authorities” we now know as the present-day governing bodies of boxing. At times over the last few decades, there have been so-called champions in every weight class sanctioned by what boxing writers as derisively refer to as the “Alphabet Soup Groups”: the World Boxing Association (WBA), the World Boxing Council (WBC), the World Boxing Organization (WBO), and the International Boxing Federation (IBF), to name just a few. At any given time there might be three, four, or even five champions of each division—and new weight classes such as “super lightweight” or “super middleweight” made boxing more difficult for even the astute fan to follow. Even a casual sports fan, then, would realize that there isn’t enough talent available in the United States to fill all those titles. So boxing’s bogus governing bodies began to look overseas for more ring fodder. Sometime around the year 2000, the Americans' dominance of heavyweight boxing started to drop off significantly. Today, only three American fighters are recognized as champions of the eight categories, and of the 80 contenders in those divisions, only 15 are American. By contrast, for much of the 20th century, it was not unusual for Americans to hold all the titles in the heavier divisions from heavyweight to lightweight. It’s worth noting that foreign-born fighters in several weight classes have achieved great popularity among American fans in the last few decades, usually after they’ve immigrated and lived in the U.S. long enough for fight fans to become familiar with them—like Manny Pacquaio, who is Filipino, and Roberto Duran, who was born in Panama. The heavyweight division, though, in particular, has begun to look especially different from its all-American past—and some U.S. fans may still be adjusting. Today, the revamped iteration of The Ring names only one American contender in its current top ten heavyweights: Chris Arreola, who is ranked eighth. The last American to claim any part of the heavyweight championship was Shannon Briggs, and even trivia experts are hard put to remember that he was the WBO heavyweight champ for seven months from November 2006 to June 2007. Meanwhile, boxing fans’ interest in heavyweights remains low. A 2002 bout between Mike Tyson and Lennox Lewis grossed the third-highest number of pay-per-view buys of any fight ever, with almost two million pay-per-view buys. But since then, no heavyweight bout has even approached a million. Today’s big-excitement, big-money fights—like Mayweather vs. Alvarez, Pacquaio vs. Marquez, and last Saturday’s Bradley vs. Marquez match—feature boxers from lighter divisions. That’s a shame for gifted heavyweights like Klitschko, and for boxing itself. Because to ignore athletic achievements like those is to ignore real, rare greatness.